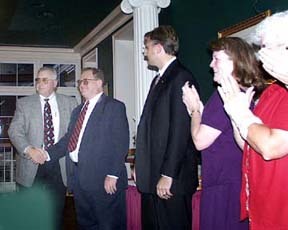 New officers for 2001-2002 are (l. to r.) Dr. Ken Clawson, Governor for the Kentucky-Tennessee District who installed the new officers; Beth Thompson, past president; Dr. Glen Kleine, vice president and president-elect; Brenda Blankenship, treasurer; Mark Calitri, president; and Danny Damrel, secretary. 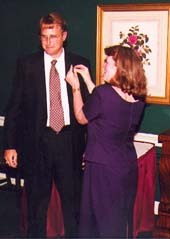 Beth Thompson, outgoing president, pins her president's pin on incoming president Mark Calitri. Retiring past 1999 president and outgoing board member David Benge receives a plaque recognizing his exceptional service to Kiwanis from Beth Thompson, club president. Dr. Ken Clawson, Governor for the Kentucky-Tennessee District, inducts and applauds Brenda Blankenship, treasurer and Danny Damrel, secretary for their long service in those posts. Incoming president Mark Calitri gives a plaque to Beth Thompson, outgoing president, for her outstanding service. 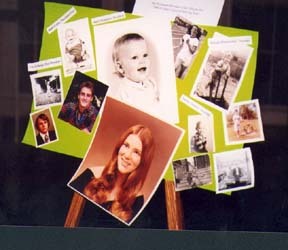 Beth made a special effort to obtain and display childhood photos of the new officers of the Richmond Kiwanis. Everyone seemed to enjoy the banquet which was held at the Arlington House in Richmond. The Richmond Kiwanis Club held its annual Awards Banquet at Arlington on September 25. Tracy Burdett was recognized for his many contributions to the Richmond Kiwanis Club by his selection as the Kiwanian of the Year for 2001. 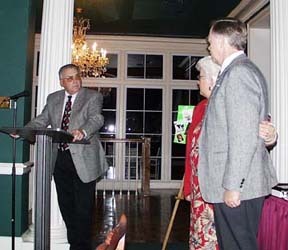 The Kiwanian of the Year award, the top recognition given by the local service club, was won by Mark Calitri in 2000. The following individuals were given Distinguished Service Awards to recognize them for service in the following projects: David Benge, Tracy Burdett, Mark Calitri, Ray Desloover, and Patrick McMahon for leadership in the annual Kiwanis Auction. Scott Truesdell for his leadership in organizing the annual Kiwanis Pancake Breakfast; Dorothy Esce and Dave Harkleroad for their leadership in conducting club Interclub visits to other Kiwanis clubs in our district. Also recognized were Mark Calitri for his organization of the annual Kiwanis Carnival; Brenda Blankenship and Bob Nayle for their leadership in administering the annual Kiwanis Golf Tournament and before heading the program sales at the All A Classic. 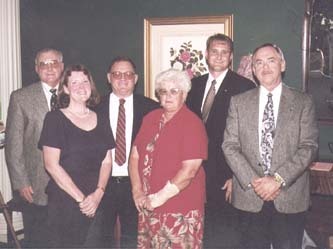 Phillis Adams who organized the any Young Children - Priority One projects; who headed the committee that selected and awarded scholarships to local high school students; Patrick McMahon for leadership in providing local Home Meals Delivery. 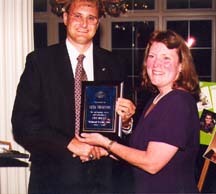 More than 10 individuals were recognized with an award for perfect attendance during 2001. 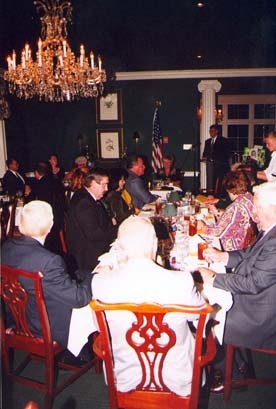 Earl Rhodes was singled out for his long-time membership as a 30 year-member of Kiwanis International. Also recognized for his recent election to Governor of the Kentucky Tennessee District was Dr. Ken Clawson. 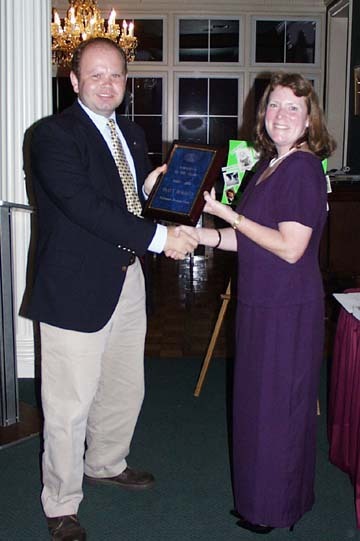 Tracy Burdett, the Vice President of McMahon and Burdett, was selected as the Kiwanian of the Year for 2001 by the Richmond Kiwanis Club. 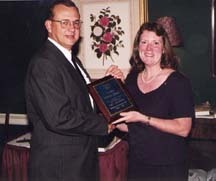 Giving Burdett the top award given by the local service club is Beth Thompson, president of the Richmond Kiwanis club.